The Functional Ingredients 2014 “Editor’s Choice Award for Best New Ingredient in a Beverage” was awarded to Cargill’s new ViaTech™ stevia-based sweetener portfolio at this year's Engredea tradeshow. 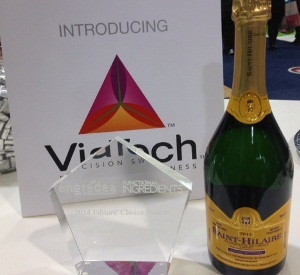 MINNEAPOLIS – March 17, 2014 – Cargill’s new ViaTech™ stevia-based sweetener portfolio won the Functional Ingredients 2014 “Editor’s Choice Award for Best New Ingredient in a Beverage” at this year’s Engredea tradeshow. Cargill launched the ViaTech™ brand during the event, which was co-located with Natural Products Expo West in Anaheim, Calif. The ViaTech™ line of stevia-based sweeteners will enable food and beverage manufacturers to achieve optimal sweetness and significant sugar reduction. With the ViaTech™ portfolio, Cargill builds upon previous stevia-based sweetener technologies by improving taste performance at high usage levels. Part of what sets the ViaTech™ portfolio apart from previous stevia-based sweeteners is the use of Cargill’s proprietary taste prediction model, which leads to clean sweetness in even some of the most difficult-to-perfect zero-calorie and reduced-calorie food and beverage formulations. Cargill partners globally with companies in the food and beverage industry to formulate stevia sweeteners for a variety of products. The ViaTech™ stevia-based sweetener portfolio adds to Cargill’s extensive portfolio of stevia-based ingredients. Visit www.cargillfoods.com/viatech for further details.